January 5, 2013, Las Vegas, NV - Newer Technology, Inc. (NewerTech®) http://www.newertech.com, a leading developer of Macintosh®, PC, iPod®, iPhone®, and iPad® performance upgrades and accessories, announced today the NuMount Pivot for securely mounting an iMac, Apple Cinema Display, or Thunderbolt display to a wall or desk. Stylishly designed in an aluminum finish to complement Apple products, the NuMount Pivot offers a full-range of extending, retracting and tilt motions to maximize display viewing comfort by reducing neck and eye strain. In addition to providing an enhanced view, the NuMount Pivot also maximizes productivity by elevating the display above the desktop for greater workspace utilization. The NuMount Pivot will be shown in Other World Computing's booth #5812, LVCC North Hall, at the Consumer Electronics Show (CES), which begins Tuesday in Las Vegas, Nevada. Maximum Flexibility for Comfort and Productivity The NuMount Pivot is ergonomically designed to provide full-range flexibility, allowing users to position their screen for maximum comfort. With its flexible extending and retracting neck and tilting capabilities, the NuMount Pivot can easily be positioned with one simple motion to ease eye and neck strain. The NuMount Pivot can also rotate 90 degrees to a vertical portrait view for less time scrolling and more time reading. Elevate Your Screen and Save Valuable Workspace The NuMount Pivot is available in two models to attach securely to either a wall or desktop and elevate an iMac or Apple display without the space-consuming factory base. By elevating the display, a keyboard and mouse can now be slid underneath the screen when not in use. And the arm of the NuMount Pivot conveniently routes connecting cables from the display and computer machine for a clutter-free workspace. Compatibility, Pricing, and Availability The NuMount Pivot is compatible with the mid-2007 through mid-2009 24" iMac; late 2009 through 2011 27" iMac; 24" & 27" Apple LED Cinema Displays; and 27" Apple Thunderbolt Display. 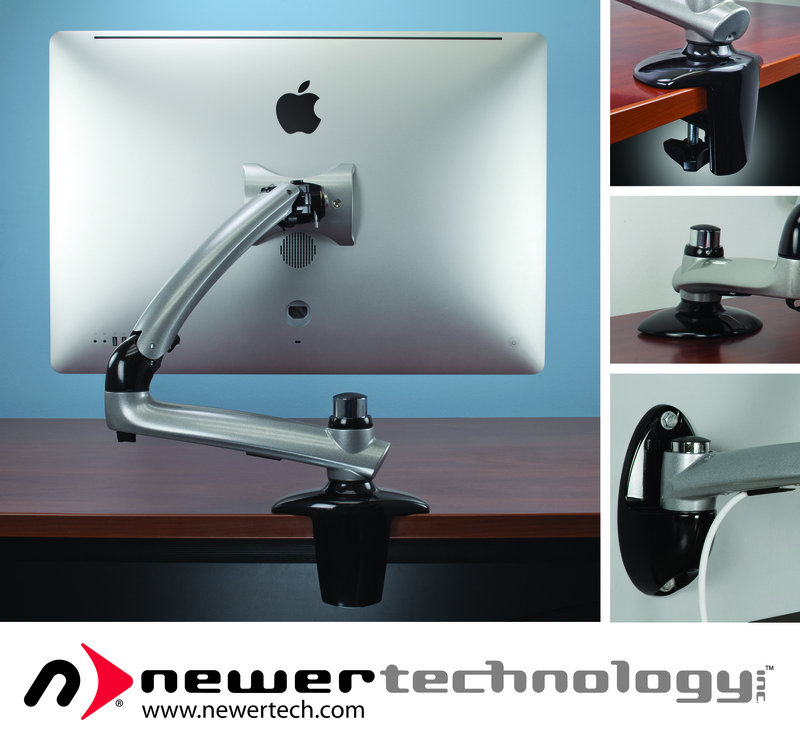 The NuMount Pivot wall mount model has an MSRP of $159.00, while the desk mount model has an MSRP of $189.00. Both models will be available for ordering later this month. For more details on the NuMount Pivot, as well as reseller inquiries, visit: http://www.newertech.com. Provides full-range of extending, retracting and tilt motions to maximize display viewing comfort by reducing neck and eye strain.